From cloud services to data security, TechMD helps businesses leverage technology to maximize efficiency. So it was especially important they find a way to streamline their own inboxes. 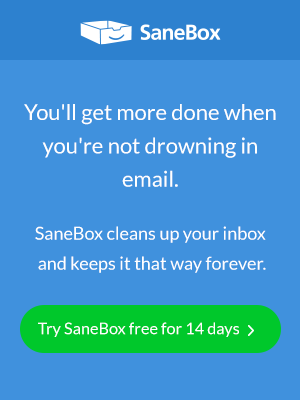 SaneBox was the answer to all their email problems. Between auto-generated notifications, messages from clients, and internal communications, email is central to the daily operations at TechMD. It’s also the biggest drain on time and energy. As with most companies, email is the most common form of communication at TechMD, and it was too easy for important messages to slip through the cracks. Jason Gimeno, TechMD’s CTO, was frustrated by the way that “junk email filters or other kinds of things have always kind of failed.” It was a 50/50 chance that the email would end up in the right place. Choosing what to prioritize and finding ways to maintain focus were huge challenges for the team at TechMD. Igreti dreaded opening his inbox because it was constantly full to bursting with emails related to an impossible range of tasks, departments, and clients. Filtering through the noise was an overwhelming prospect for everyone. TechMD needed to find a way to get the company’s communications organized and keep teams on track. Igreti was most impressed by how SaneBox trained his inbox to filter messages. He loved how with SaneBox “you can train emails, so if you have an email that pertains to say, newsletters, you can train it to always go into your news folder.” He saw that this would be a game-changer for his team, so he instituted SaneBox company-wide and hasn’t looked back. I don’t dread opening my inbox like I did before — SaneBox consistently keeps your inbox clean after you train it, so you never really have to worry about it. From day one, SaneBox has helped TechMD get their communications under control and, as Igreti put it, “helped us become a more cohesive, communicative, and collaborative team. The way that SaneBox automatically makes decisions about email priority and filters out bulk emails gives the teams the freedom they need to work more effectively. From Igreti on down the line, everyone at TechMD has seen the benefits of the SaneBox system. Ted Khuu, Director of Managed Services, fell in love with the SaneNoReplies feature. When he sends emails that need a response, SaneBox automatically adds those conversations to his NoReply folder. At a single glance, Khuu can see which emails to follow up on to get the response he needs. SaneBox’s analytics suite and dashboard also allowed TechMD to gamify email and add a bit of fun to an otherwise exhausting task. They’ve enjoyed tracking who saves the most time in the office and who has the highest reply rate percentage — giving everyone an opportunity to achieve some serious office email cred. Now that they’ve adopted SaneBox, Igreti says it has “changed the way we interact with email by letting us prioritize what’s really important during the day. I don’t have to worry about not responding to certain emails, because I know that the important messages will come to my inbox, and the things that aren’t as pressing will be pushed to SaneLater.” As a result, operations are flowing more smoothly, customers are getting the attention they need, and the TechMD team is stronger than it’s ever been. TechMD is an award-winning IT solutions firm that specializes in cloud solutions, cybersecurity services, strategic consulting, and managed services. They are passionate about bringing enterprise-level productivity, scalability, and security to small and medium businesses. To find out more about them, visit them their website, or find them on Facebook, LinkedIn, or Twitter. A distraction-free inbox is proven to increase productivity and reduce stress. Learn why employees at Shopify, Adidas, Linkedin, eBay, Coca-Cola and hundreds of other companies rely on SaneBox to eliminate email distractions at their office. Help your team spend less time on email. Get in touch with us today!